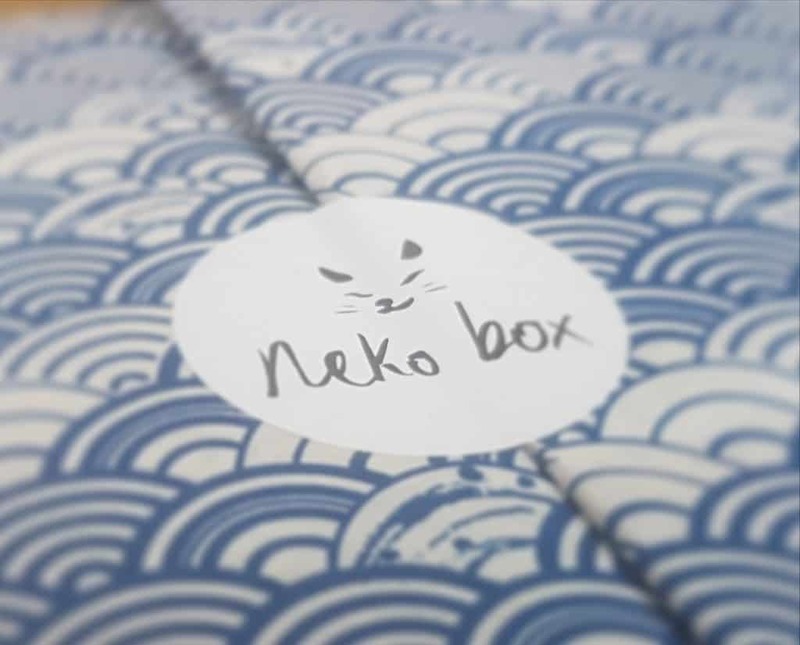 Neko Box is a monthly subscription box full of beautiful Japanese lifestyle goods sent directly from Japan. 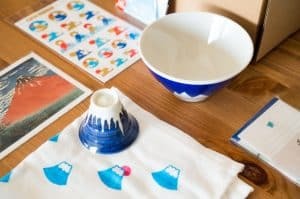 These include Japanese-made items such as ceramics, stationery, textiles, art prints, traditional crafts, and other homeware. You can subscribe monthly for $34.99 (£27.93), 3 months prepaid at $92.99 (£74.22) or 12 months prepaid at $347.99 (£277.75). As is usually the case, longer subscriptions mean pretty good savings on the monthly price. Shipping varies depending on location, but is $10 (£7.99) to most countries. You can choose regular or express ($14). Please note currency conversions are correct at the time of writing. 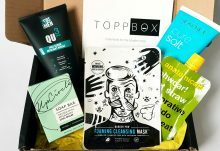 Every monthly box is based around a different theme. 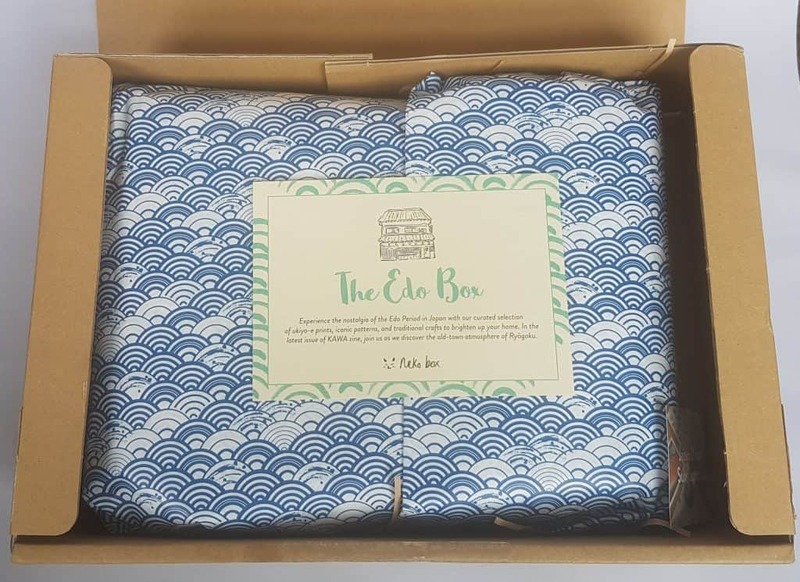 I was sent the April box, and the theme was Edo. Briefly, Edo is now Tokyo, but in the 18th century was one of the largest cities in the world. The Edo period (1603 – 1868) was a time of peace, and huge cultural and technological change. Some of the patterns represented in this box were some of the most popular designs of the Edo period, and are now iconic symbols of Japan. So, on to the actual box. Of course I was not in when it arrived, so I had to do the usual schlep to the sorting office to collect it. But I don’t mind, and at the risk of giving my opinion away, this was totally worth the trip. Arrived in perfect shape, which is fortunate because, as you will see, it contained some breakable stuff. But the packaging is superb. Isn’t their logo cute? I love the inner packaging. The lining paper is the traditional Japanese Seigaha (wave) pattern, and it’s such nice quality I’ve saved it. The card on top has the menu on the reverse, describing each item. I love how they’ve used little sketches of each item along with the descriptions. Oh, and they always put the total dollar value on the card. I was very careful opening up the paper because I didn’t want it to tear. There was a sticker holding the folded paper together, so I unpeeled it very carefully. And there’s that cute logo again! When I opened it up, the first thing sitting on top was their magazine, Kawa. This is a lovely thing to be included. 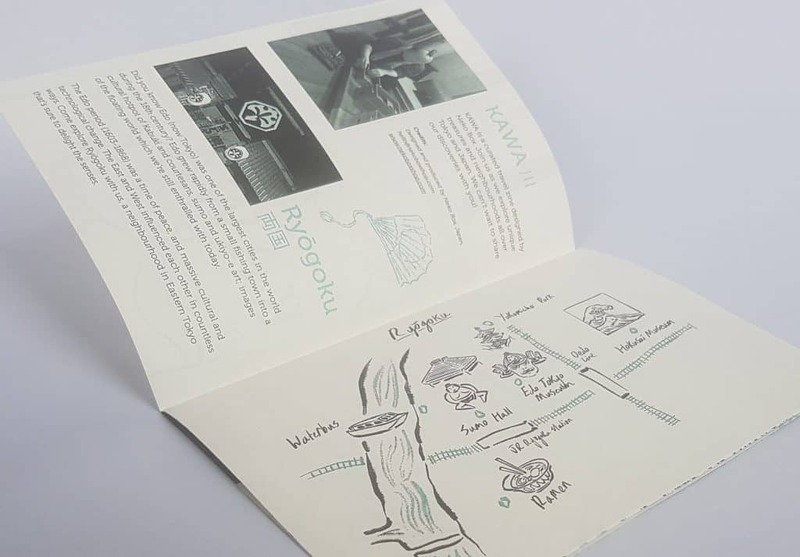 It’s a little travel zine, and contains information about a chosen area, with some culture and history, plus some absolutely gorgeous illustrations. Just lovely, and very interesting. It’s thoughtful, and while it’s certainly not exhaustive, it has just enough detail to pique your interest and round out the experience. These are two (very good quality) postcards of woodblock prints from two of Japan’s most well-known artists. 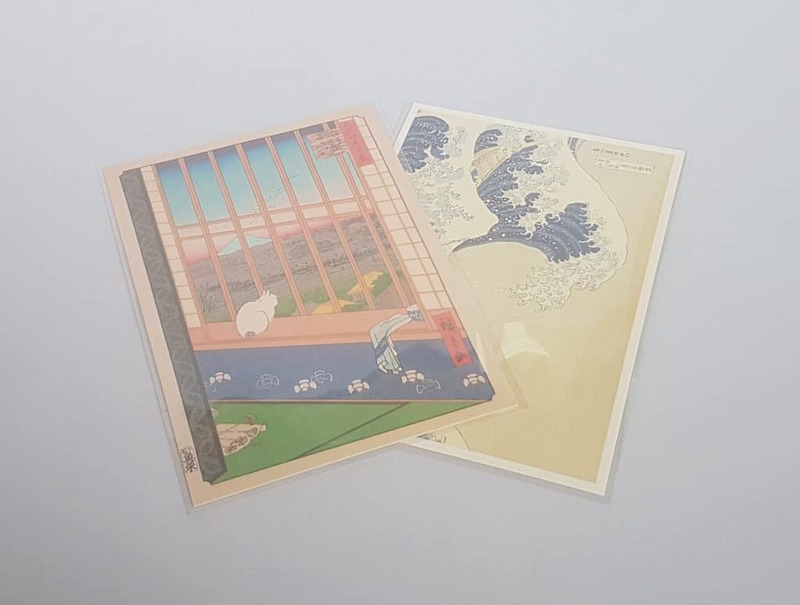 You’ll probably recognize the wave print, it’s by the artist Hokusai, and the cat print by Hiroshige has Mt Fuji in the background. They come in little plastic sleeves to protect them, which means they’re much more likely to be kept pristine until you can put them up on the wall. As you can see from the menu above, this is a Seigaiha wave Print Cloth. It’s 100% cotton, and can be used in a multitude of ways. It’s lovely soft material, and I’m going to hoard it in my stash of lovely fabric. 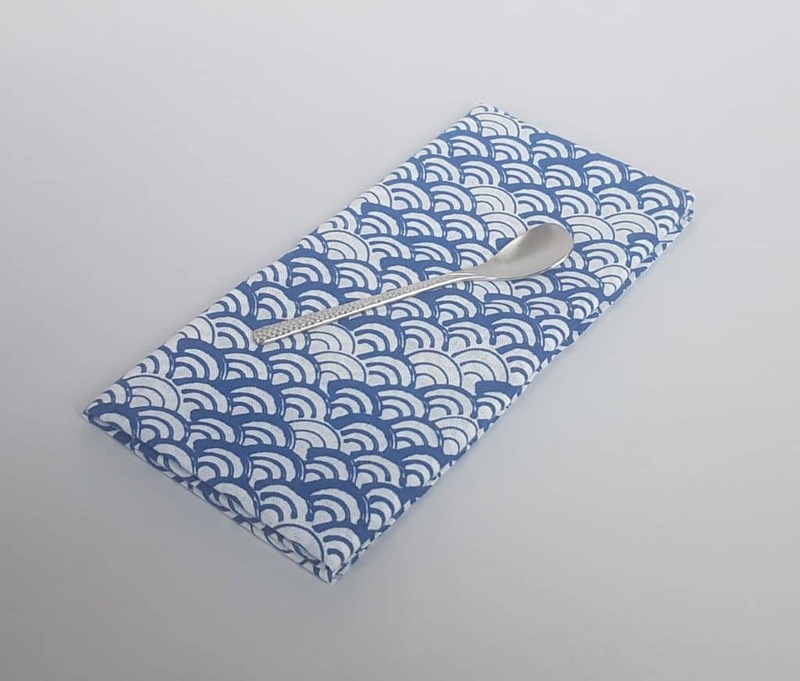 The spoon is of hammered metal in a traditional Japanese design. It’s perfect teaspoon-size, and the surface is wonderfully tactile. It’s a small thing, but it’s incredibly pleasing to use, and has gone into our cutlery drawer. I’m a big believer in having lovely things which are also practical. I’ve put the spoon on the plate to give you some idea of scale. This is the other popular Edo design, Asanoha, meaning leaf. 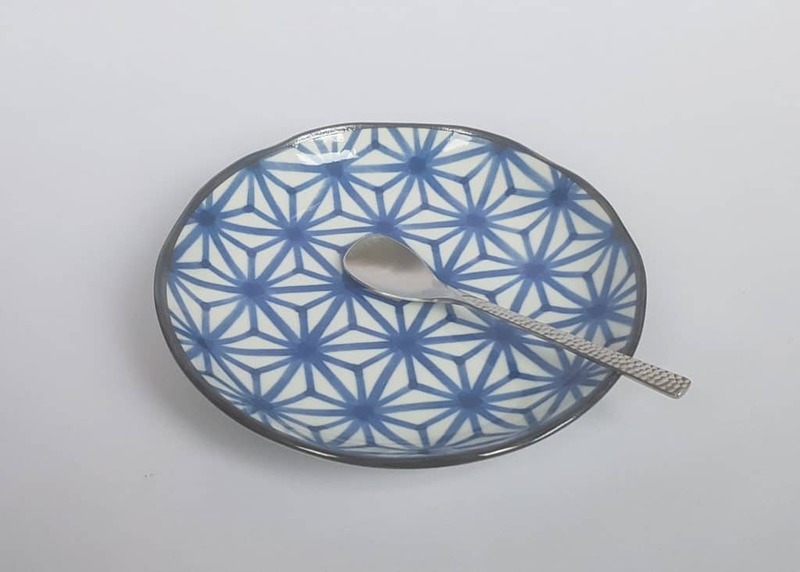 I love the geometric nature of the pattern, and if you look carefully at the edge, you can see the rim of the plate is has a very gentle wave to it. Again, this is a simple and charming item. And finally, we have something fun. 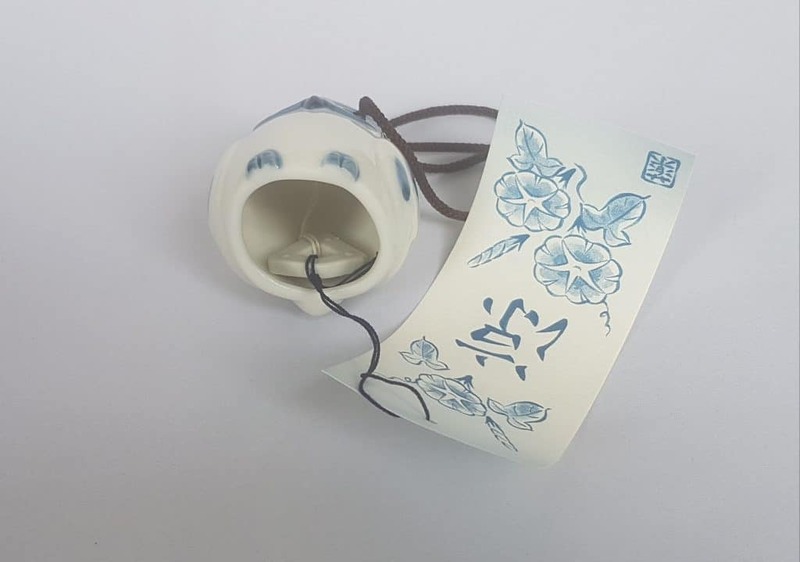 A ceramic wind chime. These are often hung outside Japanese houses, and make a lovely tinkling sound in the breeze. You can see the little ceramic chime inside. 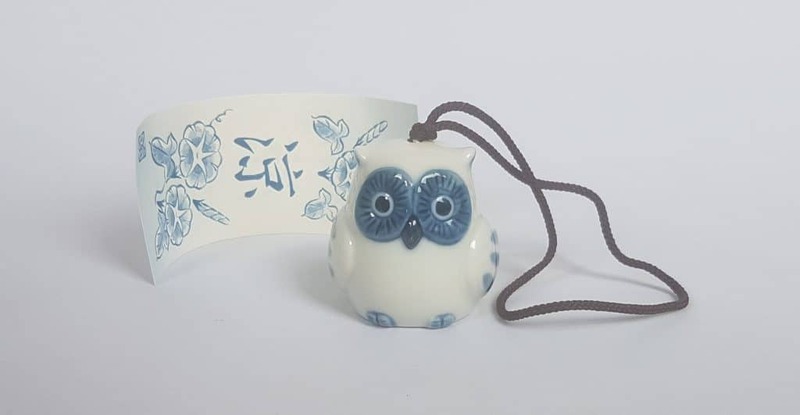 I also discovered that the owl is a lucky charm symbolizing good fortune. I don’t want to risk hanging this outside, as even in April in the UK the wind can be pretty fierce, and I don’t want it to end up in little pieces on the ground. Instead I’ve hung it up in one of our living room windows, where it’s a discreet but lovely presence, and hey, everyone needs good fortune in their lives! My gaming-obsessed husband is a great fan of Japanese culture, and as it happens one of his recent games, Nioh, is partially set in the Edo period. I also bought him a Japanese print as a wedding present. So this box was a lovely bonus for him! In some reviews I do a breakdown of value versus cost. I’m not going to do that here, because all these items are sourced direct from Japan, and finding prices would be impossible. Instead I’ll simply give my opinion. 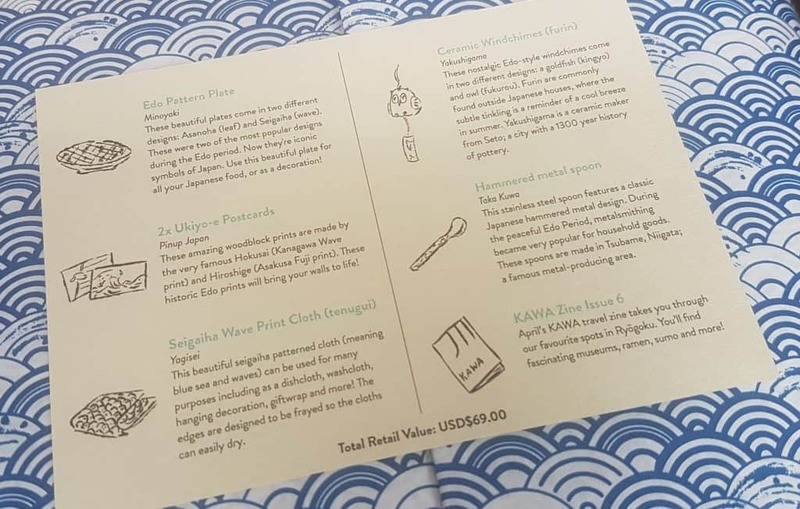 According to the menu card, the value of the items is $69.00 (£55.10). The cost of a single box plus shipping is £35.92. Given all these items come from Japan, are are clearly of good quality, this total seems more than reasonable. There is plenty of bang for your buck (yen?). 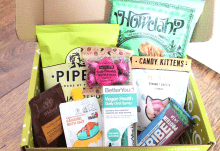 Additionally, the selection of items has clearly been made by people who know what they are doing, and have produced a wonderfully balanced mix. 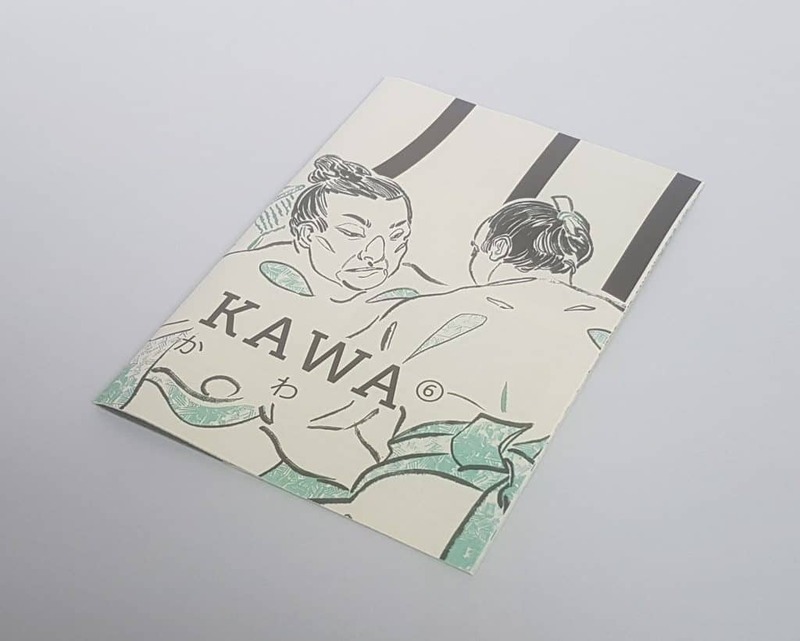 I love Japanese aesthetic, without knowing a great deal about it, so I was very glad to have the opportunity to review this. 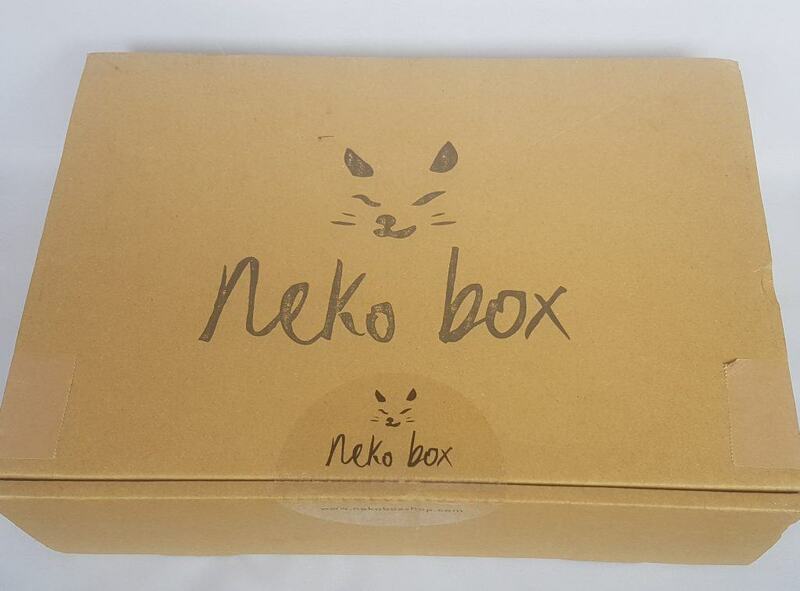 I’ve been fortunate to explore other Japanese boxes of very different types (kawaii and snacks), and while I’ve enjoyed those immensely this one was on an entirely different level. Every item is of lovely quality. The information on the contents, as well as the magazine, has just the right amount of detail to make you feel as if you have learned something without the delivery being didactic. The packaging was beautiful. 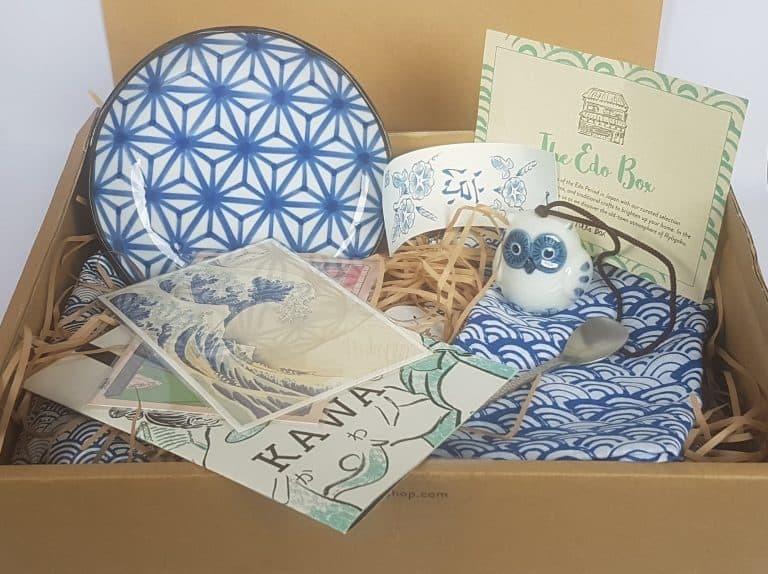 As well as the reassuringly sturdy box, the contents were very well packed in shredded paper, and the ceramic items were bubble-wrapped and boxed. The paper wrapping inside was nice enough to keep, and their logo is adorable. Incidentally, Neko means cat in Japanese. I can honestly say that this is one of the most delightful collections I have had the pleasure of receiving. Just the process of unpacking and photographing everything was curiously soothing, and every item was a pleasure to handle. It actually made my feel happy exploring the contents, and that feeling was renewed every time I went back to them. Even using the spoon this morning made making my tea more satisfying. This box was so incredibly good I’m at risk of descending into purple prose, so I shall finish by saying that this is as impressive as anything I have seen yet, and I can’t recommend it highly enough.